Description: Azzio’s Convent Church marks a significant piece of Valcuvia’s valley history (province of Varese). And to Mascioni, a greater one still: the company was born right here. Thanks to generous donations the church has been totally restored, and now a new organ can again complete its artistic and musical life, too. 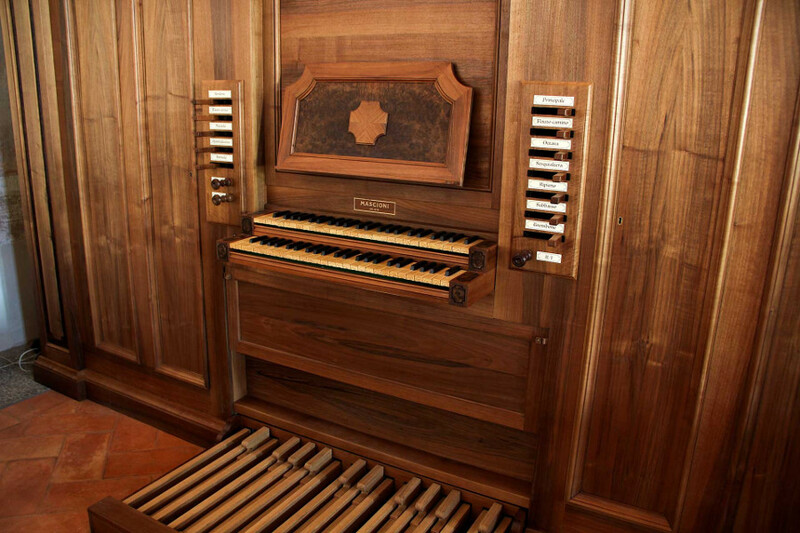 Of two manuals and pedals, it’s a seventeenth-century Italian ripieno in the truest sense within a case to match. Drawn up by Maestro Lorenzo Ghielmi, the specification puts 17th century Baroque music as a target, notably the works of Bach, a musically spiritual leader if there ever was. Technically, a two manual suspended key action with a delicious responsive and light touch gives to the organist a perfect control. The very low wind pressure (47 mm in water column) together with a particular way of voicing (low mouth of the pipes and no nicks) gives to the sound a particularly richness in harmonics and we can say this instrument has resulted to be very inspiring and rich of soul.